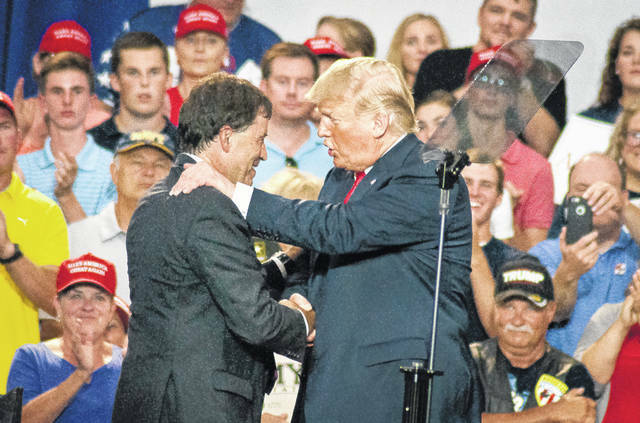 President Donald Trump made a personal appearance on Saturday in Delaware County to rally support for Ohio’s 12th Congressional District Republican nominee Troy Balderson. Before turning the podium over to Balderson, the president exchanged a quick handshake and greeting with the candidate before a crowd of thousands at Olentangy Orange High School in Lewis Center. President Donald Trump spoke before a crowd of voters Saturday at Olentangy Orange High School to gather support for Troy Balderson, the Republican candidate for Ohio’s 12th Congressional District. 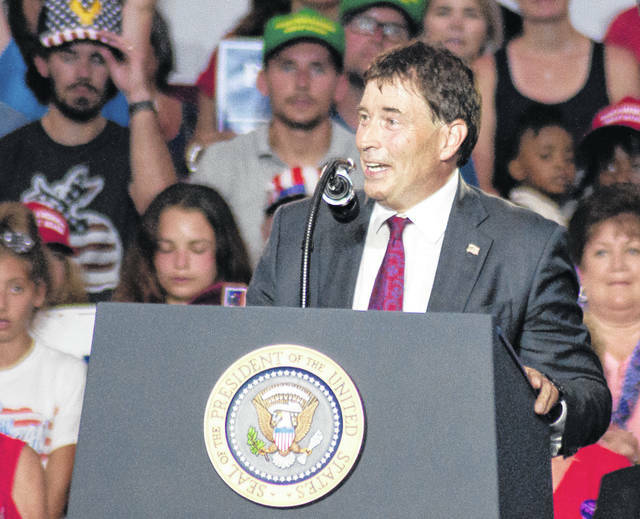 Troy Balderson, R-Zanesville, stood before thousands of people packed into Olentangy Orange High School’s main gymnasium on Saturday to speak about his candidacy for Ohio’s 12th Congressional District. 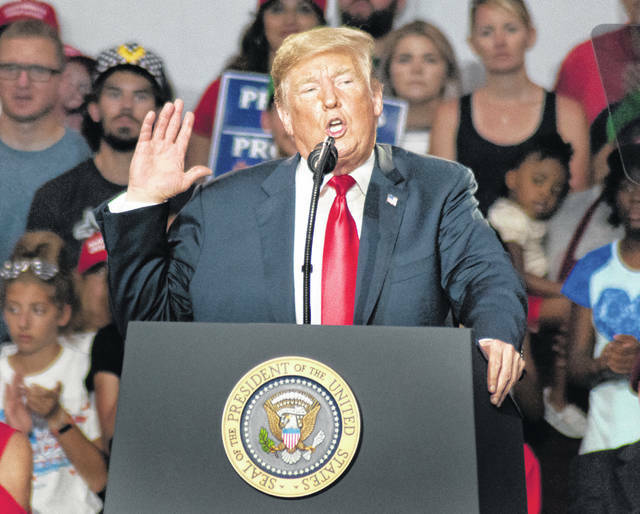 Despite Saturday’s 90-degree weather, thousands of Ohioans converged on Olentangy Orange High School in Lewis Center to witness a sitting president of the United States of America speak in Delaware County. With thousands packed into the gymnasium and crowds of others spread throughout overflow areas across the high school campus, President Donald Trump spoke Saturday for over an hour, even pausing 50 minutes into his speech to comment on the sweltering temperatures inside the building. “Even though it’s 110 degrees in this crazy room, if you can take it, I can take it,” he told those in attendance, many of whom were using various Trump signs to fan themselves. The planned visit, which was originally scheduled to be held at the Delaware County Fairgrounds but was moved to OOHS in order to accommodate a larger crowd, centered around the highly contested race between state Sen. Troy Balderson, R-Zanesville, and Franklin County Recorder Danny O’Connor, D-Columbus. Both men are seeking voter support to fill the remaining term of Rep. Pat Tiberi’s, R-Genoa, seat in the U.S. House of Representatives, where he represented Ohio’s 12th District. Tiberi resigned from the seat in January to accept a position as the new head of the Ohio Business Roundtable. Trump predicted if Balderson is elected to Congress during the special election on Aug. 7, he would be representing the 12th District for quite some time to come. “We have a man that’s going to fight for you, who is going to fight for Ohio, and he is going to be here for a long time,” Trump said. In addition to noting on several occasions during the speech the current state of the U.S. economy, both Balderson and Trump touched on other hot-button topics like issues affecting America’s workforce and seniors, as well as immigration. Trump touched on the country’s immigration policy by acknowledging the border wall is being built and calling out O’Connor’s stance on the issue. “A vote for Troy’s opponent is a vote for open borders,” Trump told the crowd. As for the president’s stop in Delaware County, Trump spoke several times of his admiration for the people of the “Buckeye State” who helped him win the 2016 election.